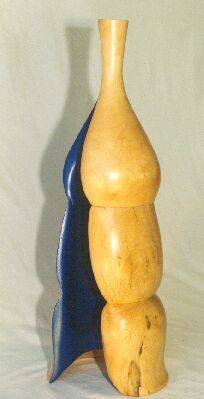 Rik Mars (1954) living in Ransdorp, The Netherlands, is an artist working mainly in wood. He makes furniture, but he also creates abstract objects. The wood itself should tell the tale. To get from the wood or the log what Nature put into it is the objective. Wood is my choice, for the beauty of the material. Behind this page are many others to visit. All filled with Wooden Objects by Rik Mars. Click wherever the pointer changes changes from arrow to hand. E.g. on all pictures. I wish you a nice time with this art.